Mitsubishi Electric is an industry leader in split-ductless air-conditioning technology. Mitsubishi Mr. 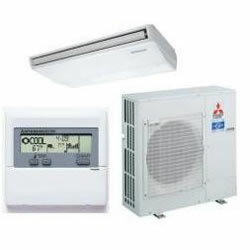 Slim systems have three main components: an indoor unit, an outdoor unit and a remote controller. The Inverter Technology maximizes energy savings by making sure only the energy needed to cool or heat an area is used. The Powerful Mode function permits system to temporarily run at a lower/higher temperature with an increased fan speed, which quickly brings the room to the optimum comfort level.